← WANNING SUN. Megaphone diplomacy is good for selling papers, but harmful for Australia-China relations. The giant Pine Gap intelligence and military base outside Alice Springs consumes a great deal of electricity to operate its intelligence-gathering and analysis operations. It now appears that the Turnbull government’s rejection of a $25 bn. bid for the NSW-government owned Ausgrid electricity distribution company on national security grounds from the Cheung Kong Consortium (CKI), owned by Asia’s second richest man, Li Ka-Shing, and State Grid of China (SGC) was prompted by concerns about Pine Gap, possibly including its electricity supply. At the time of the veto, the government did not publicly identify the national security concerns that prompted its decision, which came at a diplomatic cost in bruised relations with China and an opportunity cost of more than $4 bn. to the NSW government when it subsequently sold to an Australian consortium for $20.1 bn. Peter Hartcher reported in the Sydney Morning Herald that the government’s decision to veto the Ausgrid bid was prompted by a realisation at ‘half a minute to midnight’ by the Australian Signals Directorate, which operates Pine Gap together with the U.S. National Security Agency, that ‘Ausgrid hosts a piece of infrastructure that is a critical support’ to Pine Gap. Hartcher does not identify the ‘critical infrastructure’, but one of the Chinese companies bidding for Ausgrid is known to have had a role in the supply of gas-powered electricity to Pine Gap. For almost half a century from the beginning of its construction in 1967 until 2011, Pine Gap’s considerable energy needs were provided by onsite diesel generators, with diesel fuel supplied by tankers. This changed in 2011 when primary power provided by onsite diesel-gas generators was fuelled by natural gas supplied by a pipeline from Palm Valley, with backup supplied by the same generators operating on diesel. The pipeline to supply the gas was constructed by a company under contract to Envestra, a company that owned the gas distribution system in South Australia. In 2014 Envestra was acquired for $2.37 bn. by the Cheung Kong Consortium (CKI Australia), renamed Australian Gas Networks, and then delisted from the Australian Securities Exchange. In August 2016, the Australian government announced that it would reject a bid to buy the NSW government-owned electricity distribution company Ausgrid by CKI and State Grid of China (SGC) on national security grounds. Electricity is critical to Pine Gap, and the base’s electricity supply has been upgraded as the base expanded physically and new surveillance systems were introduced. In 2002 a tender was announced for a $1.5 mn. contract to provide a new 2000 kW diesel generator and add to twelve existing diesel generators located in two buildings. 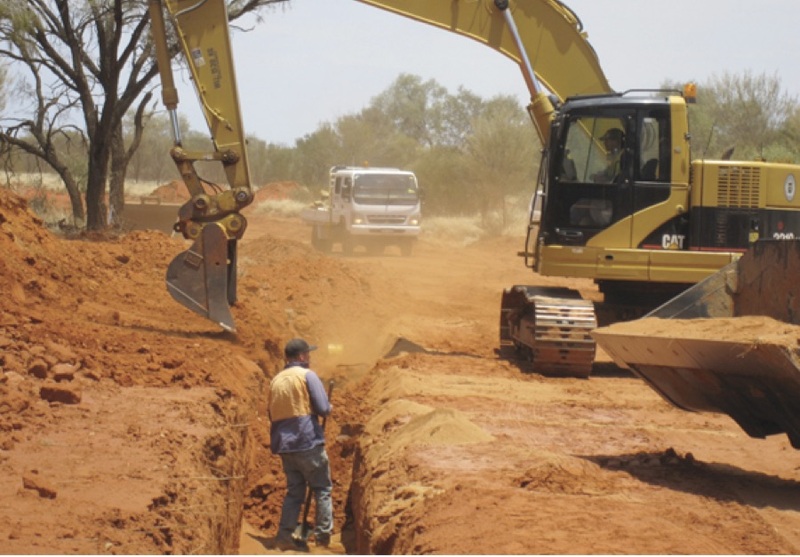 The big change came in after a 2008 Indigenous Land Use Agreement with the traditional owners of the Owen Springs pastoral lease to the southwest of Pine Gap permitted the energy distribution company Envestra to utilise a 100 m wide corridor of land 10 kms. long to build a gas pipeline. The $5 mn. pipeline branched off from the Palm Valley to Alice Springs Pipeline to two destinations, one of which was Pine Gap, and was completed by AP Group under contract to Envestra in 2011. In March 2011 the Defence Department signed a 15 year contract with Northern Territory Power and Water Corporation to supply natural gas to Pine Gap. 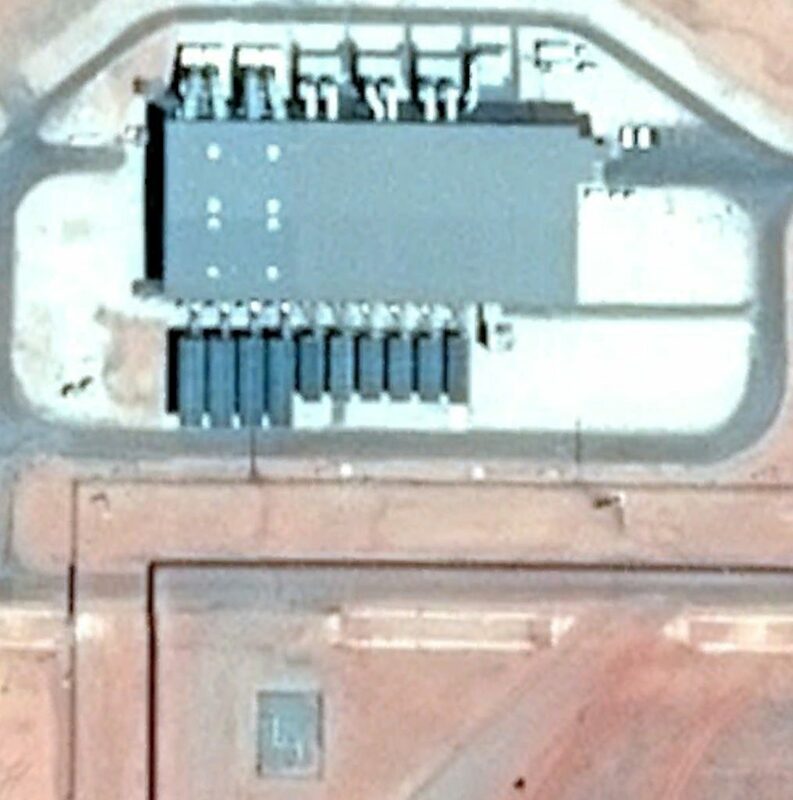 Overhead imagery shows the generator building expanding considerably between 2005 and 2013, from 1800 m2 to 2800 m2, and the six original diesel generators’ cooling radiators remaining in 2013, with four more, considerably larger, dual diesel-natural gas generators added. It is not clear whether the Ausgrid-hosted Pine Gap infrastructure Hatcher identifies was connected to the base’s electricity supply. If it was, then that would be a legitimate security concern for any Australian government – whether the would-be foreign purchaser of Ausgrid was Chinese, Singaporean or – in my view – American (Pine Gap being a US base apart!). However, the question of whether the government’s abrupt veto of the Cheung Kong Consortium – State Grid of China in its entirety was the only option left to the government would be another matter. Would it have been possible to quarantine that part of the deal that posed a national security issue, and let the CKI-SGC purchase of the main subject of the deal, the NSW grid, proceed? Hartcher’s article has let the cat out of the bag. We still cannot be sure whether the ASD objection was to CKI’s connection to the Pine Gap power supply. But either way, the government now needs to trust the Australian people to judge for themselves whether the threat warranted the response. To avoid the suspicion that the Ausgrid veto was yet another abrupt lurch in the increasingly orchestrated revivified Australian fear of China, the Turnbull government needs to make public its actual national security concerns about the Ausgrid deal, and demonstrate that there was no alternative. Richard Tanter is a researcher with the Nautilus Institute and teaches at the University of Melbourne. His work with Des Ball and Bill Robinson on Pine Gap is collected in The Pine Gap Project. This entry was posted in Defence/Security, Economy, Politics. Bookmark the permalink.